Laser Shaft Alignment Reliability Direct, Inc. Your Direct Source for Reliability, Maintenance, Test & Measurement! Modern Laser Alignment Systems make shaft alignment faster, easier and with much greater accuracy than older dial indicator alignment systems. Using Laser measurement tools instead of Dial Indicators offers additional advantages as it eliminates sag and thermal changes in the dial indicator rods or bars. A Laser Shaft Alignment System does all the calculations and graphically prompts you through each step of the alignment process. Reliability Direct, Inc. offers field proven laser alignment tools from multiple manufactures including Damalini/EasyLaser, SKF and VibrAlign for both horizontal shaft alignment and vertical shaft alignment applications. Please Visit our Knowledge Base for more Information on Alignment! TKSA 31 Laser Alignment Kit with Color Touch Screen Kit includes display unit, measuring units, brackets and hardware, power supply, usb cables, measuring tape, calibration certificate, manual and carrying case. The Fixturlaser Laser Kit is a High Quality ~ Low Cost entry level Laser Alignment System. It consists of two wireless sensor units utilizing two line lasers .The use of line lasers simplifies the setup process minimizing setup time. 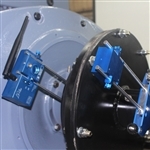 LABlue Wireless Laser Shaft Alignment System with Rugged Windows Tablet PC for use in Harsh Environments on both horizontal and vertical machines.